Selling vintage clothing, by its very nature, our business already has a great model when it comes to sustainability. We recycle old clothing. done. The environment. Completed it. Right? …wrong. There’s more to be done. I don’t know about you, but I am intimidated by the idea of saving the planet. It seems way too big a job for a 39 year old from Colchester. So we made a decision as a business to try our hardest to help in the little world we occupy. Every business has waste, it's what you do with this waste that makes a difference, and how you look after your little bit. We have a theory, that if everyone looked after their little bit, the big bit will thank you. We launched our rework department about 3 years ago….. we didn’t know what to do with the clothes that didn’t sell, had stains, or we didn’t really like. By creating this section have been giving new life to old clothing. Creating an entirely unique piece that turned from being a bit old, and out of trend, into a cool fresh piece. By introducing this area, we have reduced the wasted clothing that would other wise gone in bin, or somewhere else. The reborn team create waste. Usually in the form of scrap fabric. This would normally be thrown away. Instead of this, we use the scrap fabric to make seat covers in our warehouse, and shop. We use the bits for patching denim jackets, and other jackets to give them that standout feel. What is left after that, gets given to our Screen printing department for rags, they need for cleaning. What is left afterwards, has gone to our customers that have pets that love the fabric, or our neighbours that use the scraps. We then give up, and bin the left overs…….We aren’t 100% zero waste, but are trying to reach that goal. Any ideas on what we can do with the little scraps….always welcome. We offer recycling bins in our shop and in our warehouse for the staff to recycle their plastic, paper and cans… Ironically we only started doing this in the last year, as we had actually never considered it. Dunno why, it just hadn’t occurred to us, until we were reminded of our responsibility by a member of staff. We aren’t perfect, by any means. 7 weeks ago we upgraded our shop into a more forward thinking location…cafe, sit bit area, events, and a big freshen up. As part of this…we set ourselves a target to recycle 90% of the materials we needed for the shop fit. We succeeded. It was a challenge in improvisation, and begging a few old items, but we managed to make it happen. Even down to the old screws. If you ever come into the shop, and sit down..you can feel good knowing you are sitting on the old window display. This maybe one area where we aren’t great. 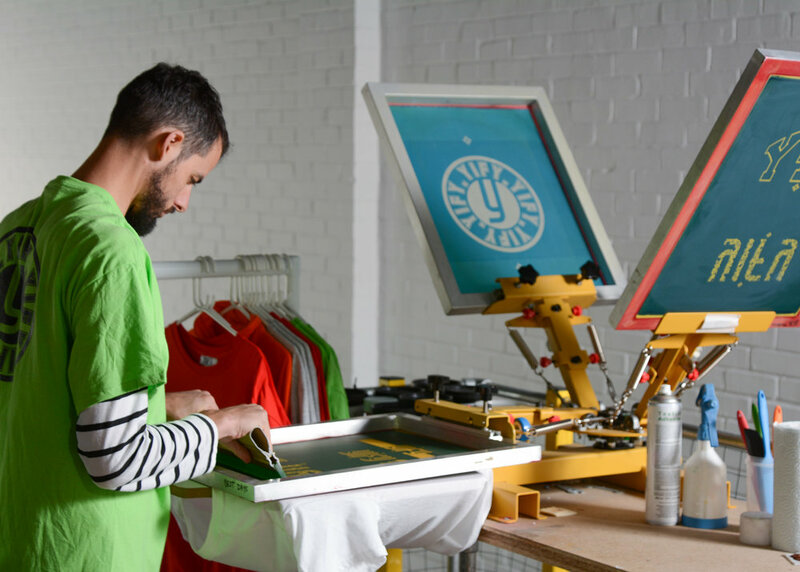 Our screen printing comes in 2 sections…..
1) we recycle old plain sweatshirts, and print our own slogans onto them, to give them something more than they had….small runs of these means that we don’t waste too much, and almost print to order. We try to keep waste down as best we can, but admit we do have paint waste and the old rags we use to clean end up in the bin. 2) Yify - We print on to new sweatshirts, as it is a brand that is aimed at a different market than vintage. So hands up, we buy in coloured sweats and hoodies to print on…..We are aware that this is something that we aren’t great with when it comes to be sustainable….the thing we do try to do is not over print….we make all items to order….keep a really small back stock/float….We deliberately don’t over buy this float, and as a result we have to set up each screen when we print…this means that it isn’t the best use of time, but we use only what we sell……. Probably why we aren’t great business men. There is still much to be done, and we can improve ourselves, and the waste we generate, but we are aware of our responsibility as a business, and what we are adding to the problems. 3)We use too much plastic when we pack our website items…we tried to make our own fabric postage bags, but it just wasn’t sustainable…with the amount we posted, and the scraps weren’t big enough to make lots of bags…..its still in my mind, on how we can make this work, but right now…its been put on hold. I’d love your thoughts on this in the comments section.